After not seeing any threads around the 150 series UHF install locations, thought I would start one. Today I pulled the left side of the car apart to install a icom-450. After removing the footplate, weather strip, left kickpanel, glove box and glove box shroud I hunted around for a place to install the unit. The unit being the 450 with the controls on the handset, I went looking for a spot that can be totally concealed with just the extension cable left out to plug the handset into. I managed to find a spot on the right of the footwell, next to the rear of the Nav unit and fans. Keeping well away from any airbag units/connections. I drilled a pilot hole into the subframe in that area and then fixed the bracket with two selftapper screws. I put some sticky foam pad between the UHF bracket and frame to stop any ratteling. After that was pretty straight forward, through the left side firewall provided grommet then connected aerial, pos+ to the isolator and neg- to the battery. It only takes 1 +screw and 4x 8mm bolts to get all the covers out, and they go back in nice and quickly. Extension cord runs up the back and into the glove box, allowing me to pull the handset and some extension cord out when in use. 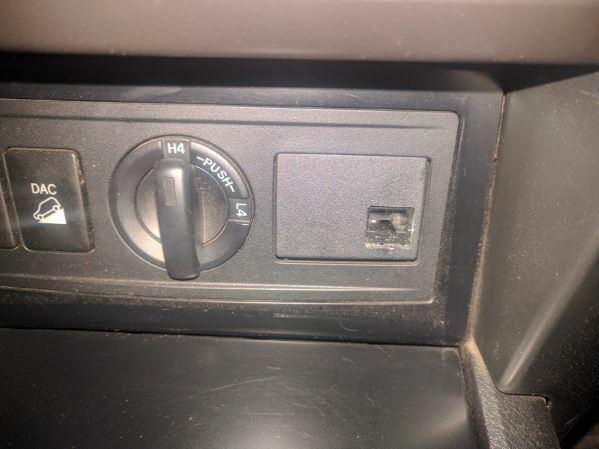 Glove box shuts fine with cord on the jam. I only use my UHF during trips so this suits me for now. May look to get a rj-45 pass throughout into on of the blanks in time. Pic attached of the location for the man unit. Thanks for the photo, I couldn't find many pics of install locations when my UHF went in. Mine's in a similar spot but with an rj45 passthrough on a blank to the right of the low/high range selector. Handset sits in the center console until it's needed. Which RJ-45 pass through did you get to fit in the blank?? Do you have a photo. Interested in doing this myself. Guys, do some searches on PP. I was confused by the myriad of uhf install locations shown on this site. In the end, got mine done professionally by Electric Bug in Adelaide, $120 for head unit, wiring, antenna. Bit of a no brainer. In 150 Prados, they install in the centre console just below the radio. Couldn't believe how easy all the fascia came off. There is a space there almost ready made to receive the head unit. Easy, clean, out of site install. All done in 2 hours. I have a GME 3550 with speaker in mike. 2012 Crystal Pearl Prado Altitude 150 Diesel Auto. Toyota mats and rear rubber mat. Toyo Open Country AT2's 265 65 R17 LT. OEM nudge bar. dual battery set up with Optima D34, rear power points front and rear Anderson plugs. Lightforce LED combi light bar. Kingsley side steps. Outback Ideas recovery points. Dr Air Pro 150 ltr air compressor. ARB 60 ltr fridge. GME 3550s UHF radio. Hema HX1. Keen to see the visuals of the finished product! I've never seen an in dash install which i'd dearly love to do to the 150!!! Would you be kind enough to upload a picture of the finished install? If thats beyond your technical expertise, I'd be happy to PM you my mobile number to send a picture message so i can upload the image. In 150 Prados, they install in the centre console just below the radio. That spot is no longer there in the facelift. I put mine under the drivers seat (Icon 450) with the mic plug on the side of the center console near the auto. Ran the aerial up onto the roof and made a mount that bolts to the roof rail under the plastic cover with the cable coming up alongside the front windows. I have photos here somewhere. I installed mine in the lower (deep) section of the arm rest centre console area. Mounted vertically with power, antenna and handset remote wiring coming out of the base and along the inside of the centre plastics shroud. RJ45 bulk head pass-through to a blank near my left knee. Mutilated a blank to fit the RJ45 bulk head connector to. Took about an hour with a dremel tool to cut it up nicely so the fit was snug. Used some 3M VHB double sided tape to mount the mic holder to the side of the top air vents. Here's a photo, the blank was supplied by TJM. And, if i want to take it out when I sell the car, i can just place the origina storage bin back in there as there are no holes or anything cut into the dash.